It's a fix if people want to actually immigrate to your country. That's not true of all the aging/shrinking countries. Might be true of South Korea, though. Immigration isn't a simple thing. It brings along a suite of effects: some of which are pretty clearly positive, others of which are pretty clearly negative, and a whole bunch whose sign and magnitude can be argued about over in That Other Subforum. Sounds like I will have high pay in the future, as one of the only workers, and the government will take all of my money since I am one of the only workers. Also, wealth taxes. It was the first time since Japan began collecting census data in 1920 that a nationwide count recorded a decline in the population, though surveys based on smaller samples have shown a downward trend for years. The population stood at 127.1 million in 2015, the Ministry of Internal Affairs and Communications said, down by 947,000, or 0.7 percent, compared with the last census in 2010. Prime Minister Shinzo Abe responded to the census report by reiterating a long-term goal of keeping the population from falling below 100 million. Projections by the government and international bodies like the United Nations suggest that will be difficult, however. The latest United Nations estimates suggest that Japan’s population will fall to 83 million by the end of the century, down 40 percent from its peak. The real problem, experts say, is less the size of the familiar “population pyramid” but its shape — in Japan’s case, it has changed. Because the low birthrate means each generation is smaller than the last, it has flipped on its head, with a bulging cohort of older Japanese at the top supported by a narrow base of young people. One-quarter of Japanese are now over 65, and that percentage is expected to reach 40 percent by 2060. Pension and health care costs are growing even as the workers needed to pay for them become scarcer. The population is shrinking more in some places than others. The biggest cities, like Tokyo, are still growing, while rural areas struggle to cope with abandoned homes and shuttered shops. The imbalance has created political tensions: The most depopulated areas send three times as many representatives to Parliament, per capita, as urban ones do. The Supreme Court has declared the situation unconstitutional, but Mr. Abe’s conservative governing party — which has strong support in the countryside — has dragged its feet on redrawing electoral districts. Interesting about the political aspect. Rotten boroughs, re-rise! In Japan! Hiroshi Suzuki had a fulfilling career in which he traveled the world as an engineer. Then, at age 65, he retired. That didn’t last long. For the past seven years Suzuki, 72, has been a nursing aide in the Tokyo area, and says he’s years away from true retirement. Economists say if Japan wants to alleviate its worsening labor shortage, it needs a whole lot more people like Suzuki, who is atypical by working into his 70s. Though it boasts the world’s oldest population, the country does an inadequate job of employing healthy seniors, they say. The reasons: Company policies, work culture and a history of rigid seniority rules that work against older employees, providing a cautionary tale to aging economies including those in Europe and the U.S.
Japan’s demographic reality is so extreme that even though it has the highest proportion of working seniors among developed countries, according to the Organization for Economic Cooperation and Development, it’s not nearly enough to stem the labor shortage. 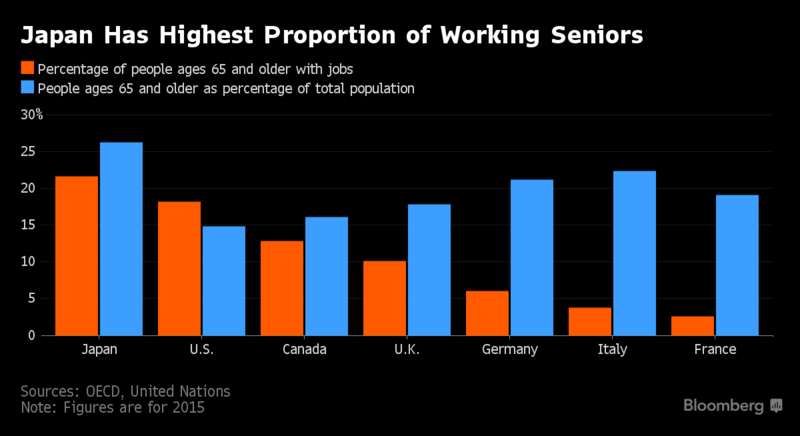 The number of workers older than 65 rose to 7.3 million in 2015, or 21.7 percent of the population for that age group, according to data from the statistics bureau. The local Shinto shrine is barely hanging on. With only about 250 households left in Hara-izumi, which is technically part of nearby Kakegawa city, the village no longer has enough men to hoist up the traditional float and parade it around during the shrine’s annual festival. All across Japan, aging villages such as Hara-izumi have been quietly hollowing out for years, even as urban areas have continued to grow modestly. But like a creaky wooden roller coaster that slows at the top of the climb before plunging into a terrifying, steep descent, Japan’s population crested around 2010 with 128 million people and has since lost about 900,000 residents, last year’s census confirmed. Now, the country has begun a white-knuckle ride in which it will shed about one-third of its population — 40 million people — by 2060, experts predict. In 30 years, 39% of Japan’s population will be 65 or older. If the United States experienced a similar population contraction, it would be like losing every single inhabitant of California, New York, Texas and Florida — more than 100 million people. Though demographers have long anticipated the transformation Japan is now facing, the country only now seems to be sobering up to the epic metamorphosis at hand. Police and firefighters are grappling with the safety hazards of a growing number of vacant buildings. Transportation authorities are discussing which roads and bus lines are worth maintaining and cutting those they can no longer justify. Aging small-business owners and farmers are having trouble finding successors to take over their enterprises. Each year, the nation is shuttering 500 schools. “Now, in every area — land planning, urban planning, economic planning — every branch of government is trying to do what they can,” said Reiko Hayashi, a researcher at the National Institute of Population and Social Security Research. Given Japan is on the forefront of robotics, they don't need to worry about having adequate nursing staff for their aging population. Anyway, we enjoy watching NHK World, and it's interesting the number of programs on the villages turning into ghost towns. Such as the one town where a resident has put a bunch of dolls in the ex-school, as there are no kids there now. Not everything is economics. Humans get lonely. I visited my ma in her "retirement community" this last week, and talked with a couple who had moved from another such community...because all their friends had been dying. So they shifted to the new one. And my ma was cooking a bunch of food for potluck for a family where one was dying of lung cancer. As in, he would be dead in about a week or so. No immigrants in Japan means ghost towns, not "affordable housing" or whatever. Haven't noticed that Tokyo is any more affordable. I will confess my Viking ancestors immigrating to the British Isles created war zones. You got me there.